POLYPIPE Manufacturer's Part Number: FIT022. 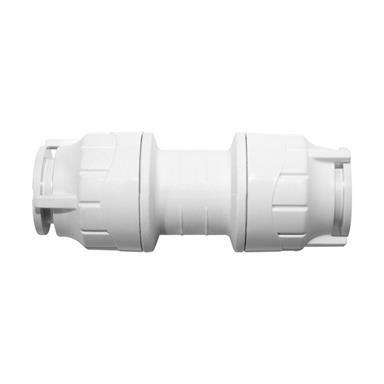 POLYPIPE PolyFit Straight Coupler/Connector, 22mm x 22mm, PolyFit Push-Fit Socket x PolyFit Push-Fit Socket. PolyFit is the one step, fully hand or tool demountable and re-usable push-fit plumbing system, which combines with Polypipe White Polybutylene pipe to create a truly flexible, yet highly secure, plumbing system that is demountable and re-usable when required. - Hand or tool demountable and re-usable push-fit plumbing fitting: Offers maximum flexibility and adjustability and is particularly suitable for first fix installations or when demountability is important. - Fitting locks tight, preventing accidental release. - Suitable for use in hot and cold water and heating systems in domestic properties. - Please note: All PolyFit fittings are supplied with pre-lubricated EPDM 'O' rings. If for any reason further lubrication is required only Polypipe silicone lubricant should be used (purchased separately). Substances such as solder flux must not be used. - Caution: Do NOT insert fingers into the PolyFit fittings, as the grab ring is sharp and designed to grip. - Guarantee: Polypipe guarantees for 25 years against defects in materials or manufacture of the PolyFit hot and cold water supply and heating systems from the date purchased. This guarantee only applies if the products are installed in accordance with the manufacturers recommendations and are used in a normal domestic operation.